Memories are strange and wonderful things, coming unbidden to the mind as we read, making subconscious connections between descriptions of reality and what we have seen. It’s the fundamental mechanism by which we judge the credibility of any work of fiction. Does what we read match our own experience? Or, for some reason, are we prepared to suspend disbelief? I remember the first car we bought. It was an Austin 7 Ruby and, one memorable day in 1952, we made the journey from our home in the North to London for the Festival of Britain. This was our first long trip and the reason I remember it so well, was the time it took. The engine was prone to fuel starvation due to a wonky carburettor which needed to be primed with petrol to restart. So when overtaken by “disaster”, we had to push the car off the road, dismantle the top of the carburettor, and dribble in petrol from the jerry can we carried for emergencies. I am therefore always highly conscious of time and geography when reading period pieces. The Silver Skull (Pyr, 2009) by Mark Chadbourn violates my temporal sense. Our London venture was about 250 miles and it took us the best part of a day, stopping at old coaching inns for rest and food. We arrived feeling like death warmed up. The physical shaking and emotional stress of never being certain we could manage another mile, took its toll. Travelling back was just as bad, and we resumed the use of rail for long journeys until we could afford a better car. As I understand it, at their fittest, horses comfortably manage about 6 miles an hour. An exceptional horse could rise to 10 miles an hour, but it would probably kill the beast if maintained for too long. That’s why coaching inns were set about seven miles apart. So when our heroes travel from London to Edinburgh, this is a journey of about 400 miles allowing for an undeveloped road system. In fact, Chadbourn makes a joke that the quality of the roads drops dramatically between England and Scotland — actually on the east coast run today, the roads become a hindrance just north of Newcastle. Yet, this novel has us in in cinematic territory with thundering hooves carrying everyone hundreds of miles without apparently breaking sweat. Thanks to years of work with Gerard Naprous, I have travelled in a replica stagecoach without the suspension system we take for granted in a motorised vehicle. It’s a singularly uncomfortable and bruising experience. When you add in highwaymen or other horsemen jumping on to and falling off the stage, life gets very interesting for spectators. So, in the best traditions of romantic fiction, all problems of distance are wished away. We travel to, from and around the Iberian peninsula like it’s our own backyard. That it may actually take days or weeks in the real world cannot be allowed to slow down the action. Except, of course, the big picture action does go slow. We have Spanish agents and the Enemy doing stuff as the Armada is readied in the background. But their timescales are left to hang while our heroes do their daring-do fighting in the foreground. Does this make it a bad book? Not of itself. It’s a fairly standard game played by many authors in writing this kind of fiction, but this is a fairly extreme version of it. Transplanting a James Bond level of mobility on to horses and sail is a big stretch. Then we come to the Enemy (the Fay). I like to understand the rules of magic systems. This lot seem remarkably temporal for a folk so supernatural. They need horses to travel over land and they have their own galleons. Stick one with a sword and it dies, but they can apparently travel underwater, physically strong doors cannot stand against them, they talk to each other through mirrors, they do good glamour work, and they have a neat line in burglar alarms — every home should have at lest one of these high-tech devices — available from a graveyard near you. So, in England we have this super magic suppressor system. They can’t do nuttin’ against our magician. Nothing, that is, apart from breaking into the most most secure fortress in London in the first few pages. Their lack of power is then re-established as they are easily intercepted by Pickering’s men when moving the stolen weapon through London. Or, for some reason, does the Enemy hand-off the weapon to Spanish agents? I am easily confused. In Scotland, where the people are denied the suppressor field — it literally stops at the border — the Enemy is still hamstrung, being unable to break through doors protected by “magic” and, worse, apparently not being able to go on to hallowed ground. When rent-a-mob turns up outside their safe house and starts throwing stones, they run off. Hardly the behavior of a credible threat to humanity. I could go on, but there should be some kind of explanation. The English nobility and the Scottish people have had centuries of experience in fighting these creatures. Everyone should know their strengths and weaknesses. And this idea that the English would attribute all weird events to Spanish agents. . . I know the weather is always bad in Scotland but, every now and then, real people must move across the border and get to see the difference. How come no-one talks about this? More to the point, there must be oral histories and folk traditions passed down through the English generations, bridging the time before the suppressor field kicked in. You can just imagine them pulling up chairs in their local coaching inns, sipping a really good cup of tea, and discussing how best to keep the Enemy from busting down their doors by using salt and herbs. So although there are some quite good moments in the book, it’s all cut and pasted together without much logic or explanation. And most of the characters are cardboard cut-outs, given nothing to do but stand around expectantly as our heroes do their hero shtik. Perhaps it works for someone who just wants a bit of swordplay in a cod historical context. But for this thinking reader, most of it is really disappointing. 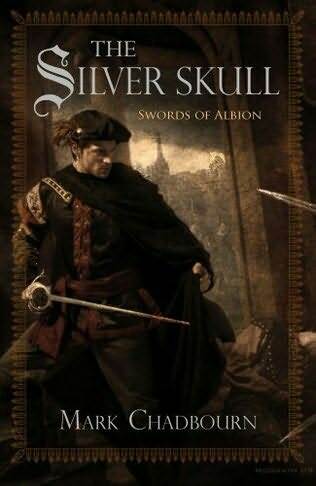 The publisher tells us this is the first in a Swords of Albion series. When the next episode is announced, I’ll toss a coin to see whether I can be bothered to buy it. Although, perhaps there’s just enough hope in the ending. 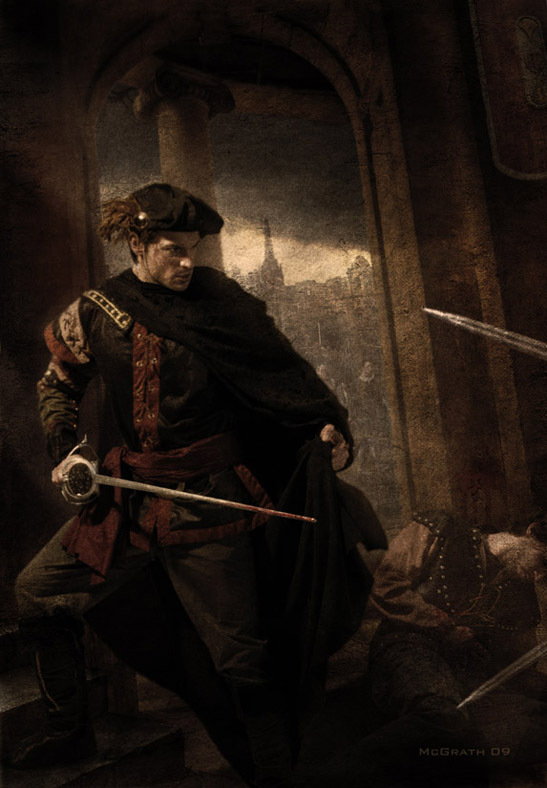 The broad themes of betrayal that run through the book hit a rich seam when the nature of the suppressor field is revealed. More of the plot makes sense at that late point. . . I’ll see how the mood takes me. In the end, I did decide to read the next volume in the series. My review is The Scar-Crow Men. Good atmospheric artwork from Chris McGrath. For a review of the final book in the trilogy, see The Devil’s Looking Glass.